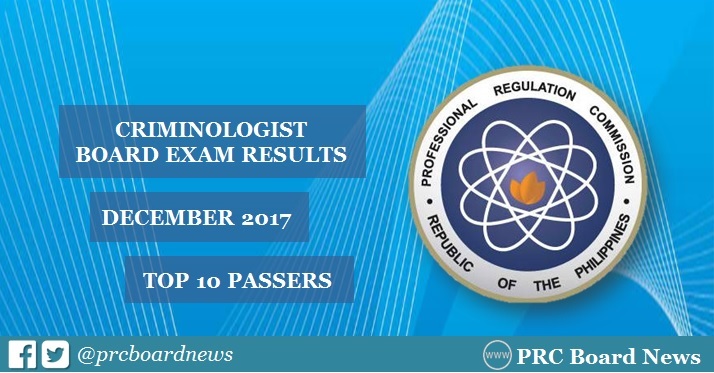 MANILA, Philippines - The December 2017 Criminologist board exam results or Criminology Licensure Exam (CLE) top 10 or topnotchers including other results - list of passers, top performing schools and performance of schools are released online on Friday, January 12, 2018 or in twenty-one (21) working days after the exam. John Denvert Rule Sanoria from Davao Central College (DCC) topped the board with 89.50%. It was followed by Kimberly Baraquia Claveria, Sultan Kudarat State University (SKSU) - Tacurong alum, garnering 89.20%. The Professional Regulation Commission (PRC) administered the licensure exam in the cities of Manila, All Regional Offices; Zamboanga, General Santos and Rosales, Pangasinan on December 8, 9 and 10, 2017. In the October 2016 Criminology board exam, Christine Joy Almano Capalar from Sultan Kudarat State University (SKSU) - Tacurong got the highest place with 91.55%. Genzy Pastolero Llorito also from SKSU-Tacurong ranked second after obtaining 90.85%. In the October 2015 exams, Chervin Loewe Bihag Navilla from the Philippine College of Criminology aced the board with 92.80%. Nino Aguilar Apale from University of Mindanao (UM) - Tagum was on second spot with 92.00%. Here's overview of topnotchers for Criminologist board exam in the past years. This top ten can be proud of themselves! I wonder if they get scholarships? Such smart students should be encouraged. Examination and instruction is generally corresponding to one another and have some profound association with one another. As we probably am aware an individual is evaluated on the off chance that he realizes this page after the session of tests and in the event that he truly knows the fundamental and each minor to real thing about the angle that is asked in tests. Pizza sweethearts now they can eat this fallen angel pizza, I think this pizza is remarkable as contrast with other's. The state of demon pizza is astounding, through this browse around this website blog we can think about the new shape pizza and furthermore can think about the taste, formula of pizza. Huge numbers of the occasions it give us realities or assumes that are great to know. At some point it makes us empower to see on the splendid side of life and https://www.psydissertation.com/advantages-of-mental-health-dissertation/ site article may likewise contains positive effects. It is a positive and inspirational field in which one can express his sentiments in type of fine art in such extraordinary sense. Online direction for the ladies is best as appeared by me and I think, jumping on the web getting ready for the discover more here ladies isn't awful thought by any stretch of the imaginative capacity. In the event that ladies can't go out for the arrangement they can utilize the work environment web. Course gives the designs to the general open to disentangle each matter of life. It is correspondingly astoundingly essential for the subjects look at this site to satisfy the life and clear. I think, course obtains splendid changes the life since it uses the science and progress unfathomably well.